Whether you're an educator, who needs to save time preparing lessons, a student who can't afford to spend the time to perform calculations manually, or an engineer or scientist who is under time pressure, Calc 3D is always useful. Compare the standard and the professional version and check out, what you need. Calc 3D is advantageous, because it solves mathematical problems in a very direct way. For example: What is the intesection of 2 line? Calc 3D answer: The 2 lines intersect at the point ... Or if they are parallel, Calc 3D tells you. There are different ways to define lines (parameter form or point form). Calc 3D knows and converts them. The standard version combinates in 3 dimensions: point, line, plane, sphere. For example: If you have a line and a plane, Calc 3D gives the point of intersection or distance. Complex numbers, when you change the real or imaginary part, the magnitude and phase angle change automatically, and vice versa. To multiply 2 complex numbers by hand, you need to multiply 4 real numbers and add the results. 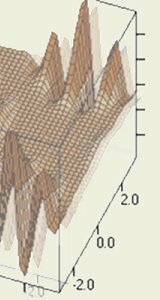 Calc 3D does it in one click. Before Calc 3D, teachers had to work hard at the board, and pupils were mostly confused. The professional version has also a graphical output. Here you can transform cartesian, spherical and cylindrical coordinates into each other.